Attack The Block | Anime etc. 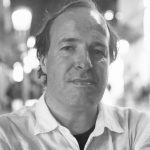 The cannily populist Attack the Block, by new director Joe Cornish, is about an interstellar first contact with the most feared life-forms in the universe. We are talking, of course, about London hoodies. There are some very familiar names in the credits. Edgar Wright is an executive producer, and Nick Frost, fresh from a close encounter in Paul, shows up in support as the gang’s affable weed dealer. 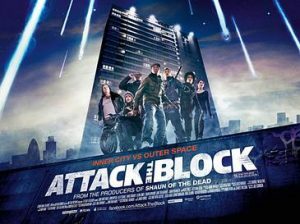 In fact, Attack the Block is a better successor to Shaun of the Dead than either Hot Fuzz or Paul. It keeps to Shaun’s basic template, as a properly British take on an Americanised genre, but it finds its own teen dynamics in place of middle-aged nerd bromance. By nature, the Block’s hoodies are less loveable than the Shaun characters, but the film feels fair in the way it goes about redeeming them, while showing they have moral hypocrisies like any middle-class stereotype. One of the sweetest moments comes when the gang, having sworn their heads off through every scene, is shocked when the Whittaker character – yes, the woman they’d mugged earlier – utters the “f” word. On the other hand, the main joke is that an alien invasion is the one time when you’d want to meet a gang of heavily-armed hoodies. The action is conventional – lots of running away from monsters in drab, shadowy Wyndham Tower, much like the REC films or the French zombie flick The Horde. The black-furred, big-teethed aliens feel like bigger versions of the meanies in the Critters films. But Attack the Block is a true horror-comedy, with genuine laughs and just enough gore. As in Shaun,you don’t know who’ll make it through in one piece, though there’s nothing as risky as that film’s “Don’t you dare shoot my mum!” routine. It’s not subtle, and I’m not sure how many re-views it’ll endure on DVD, but it earns its feelgood moral lesson. You may not buy the lesson, but at least the Block tries to say something more helpful than, say, Eden Lake or Harry Brown.